Yet more good news for owners as this month’s update brings news of yet another price increase. 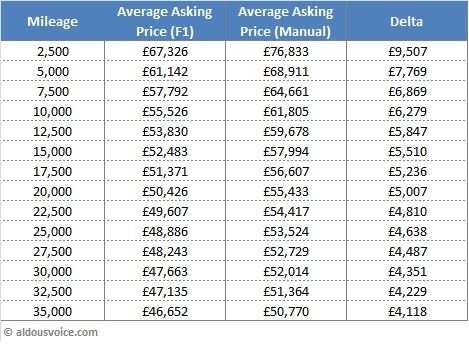 Average asking prices have increased a whopping 4.15% MoM which brings the price index to 111.23. 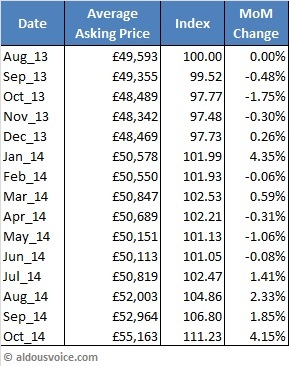 The last twelve months have seen an incredible 14% rise in prices. 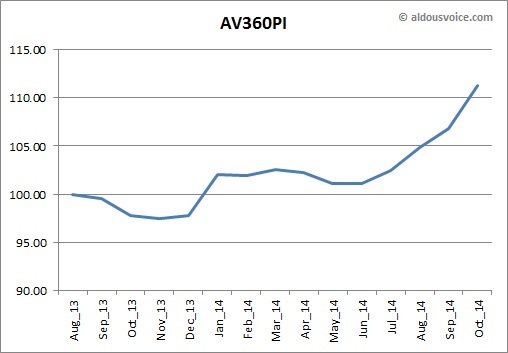 The number of cars offered for sale remains broadly the same as per the last few months, however it is nearly half that seen this time last year. 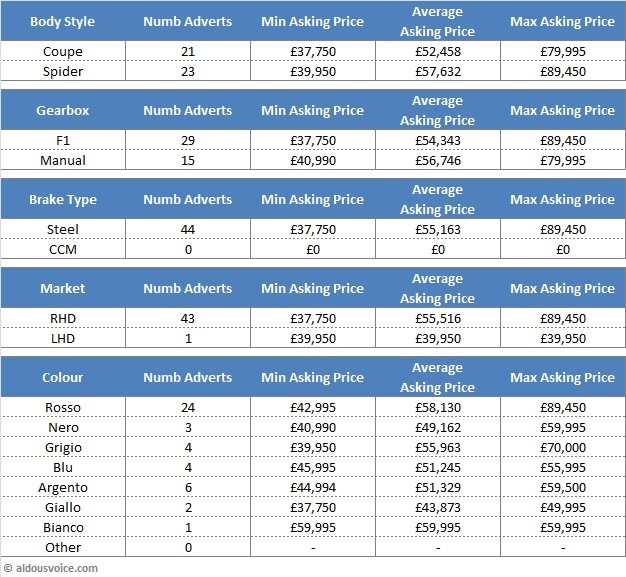 The number of cars priced over £55k has increased markedly and activity appears to have been strong with 31 cars dropping out of the data (presumably sold) and 32 new entrants to the market. 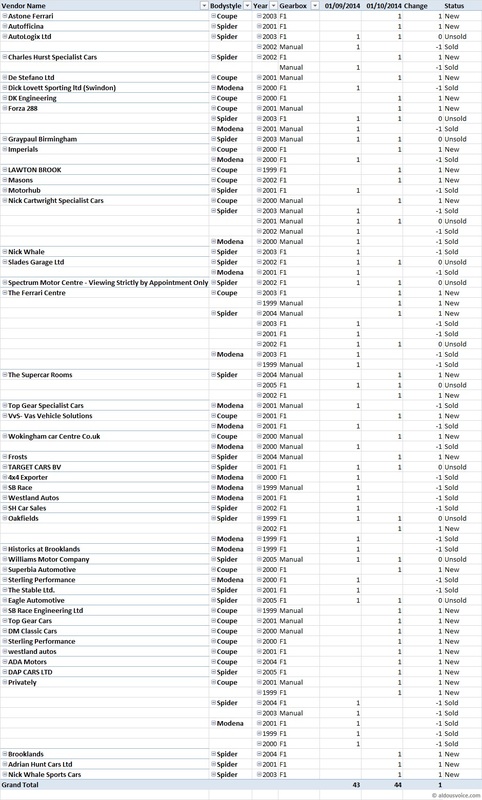 Here’s the main data table. I have improved my algorithm somewhat and am now collecting more data across more models. For the first time I am differentiating between LHD and RHD cars. Please ignore the brake type table (the program has been coded to work on various tipos). 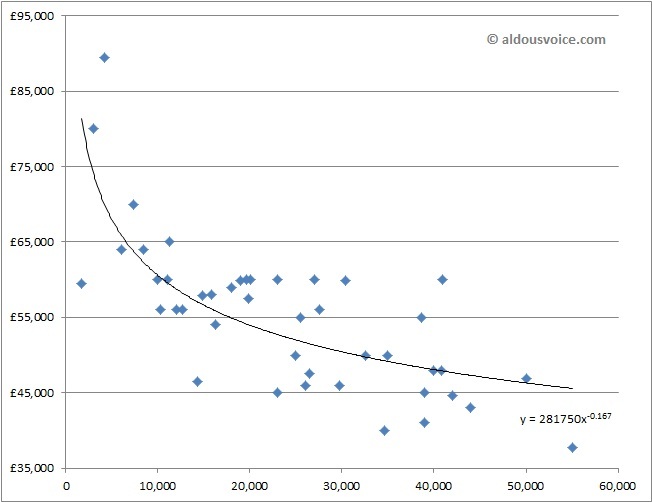 I am now able to quickly prepare a two-factor comparison of mileage vs price vs another differentiator. 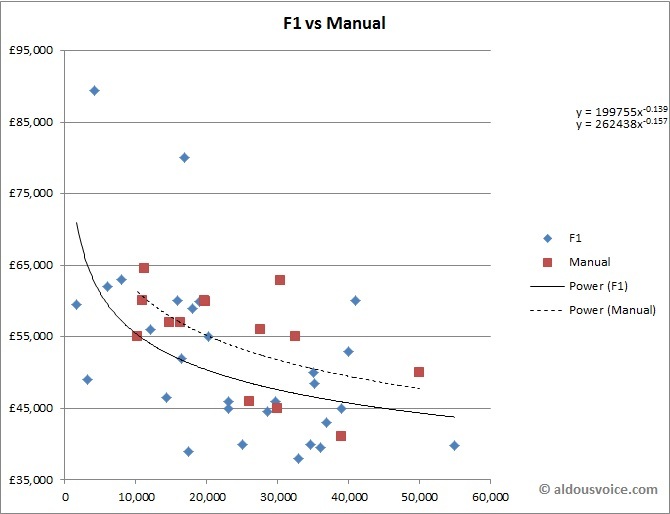 To demonstrate I have compared manual transmission cars with F1 equipped ones. 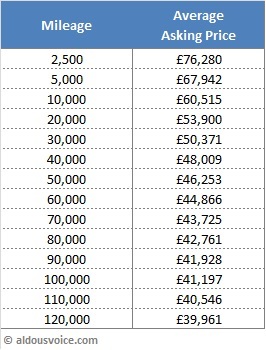 As you can see there is a definite premium for the stick shift of approximately £5k. Personally, I think this is slightly exaggerated but it will be worth keeping an eye on it. 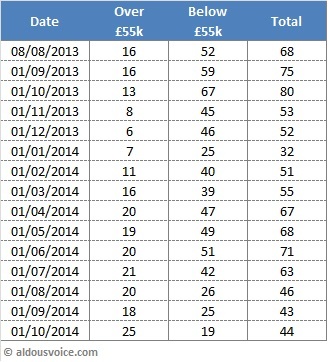 Finally, here’s the big table showing which cars are new, sold and unsold. As with all the charts you can click on it and zoom in for a bigger view. Please get in touch if you have any questions or would like to see any further breakdowns. Thanks Aldous – very useful as usual. Typical that my ability to buy coincides with a 14% YOY price rise!